Charlemagne, or Charles I, was one of the great leaders of the Middle Ages. He was King of the Franks and later became the Holy Roman Emperor. He lived from April 2, 742 until January 28, 814. Charlemagne means Charles the Great. Charlemagne was son of Pepin the Short, King of the Franks. Pepin had begun the rule of the Carolingian Empire and the golden age of the Franks. When Pepin died he left the empire to his two sons, Charlemagne and Carloman. There would likely have been war between the two brothers eventually, but Carloman died leaving Charlemagne to be King. The Franks were Germanic tribes mostly living in the area that is today France. Clovis was the first King of the Franks to unite the Frankish tribes under one ruler in 509. Charlemagne expanded the Frankish Empire. He conquered much of the Saxon territories expanding into what is today's Germany. As a result, he is considered the father of the Germany Monarchy. At the request of the Pope, he also conquered the Lombards in Northern Italy and took control of the land including the city of Rome. From there he conquered Bavaria. He also took on campaigns in Spain to fight the Moors. He had some success there and a portion of Spain became part of the Frankish Empire. 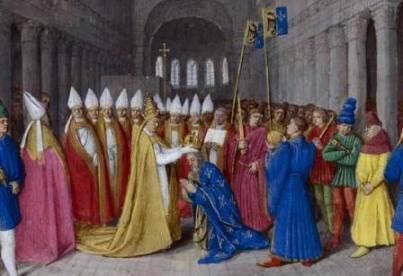 When Charlemagne was in Rome in 800 CE, Pope Leo III surprisingly crowned him Emperor of the Romans over the Holy Roman Empire. He gave him the title Carolus Augustus. Although this title had no official power, it gave Charlemagne much respect throughout Europe. Charlemagne was a strong leader and good administrator. As he took over territories he would allow Frankish nobles to rule them. However, he would also allow the local cultures and laws to remain. He had the laws written down and recorded. He also made sure the laws were enforced. A number of reforms occurred under the rule of Charlemagne. He instituted many economic reforms including establishing a new monetary standard called livre carolinienne, accounting principles, laws on money lending, and government control of prices. He also pushed education and personally supported many scholars as their patron. He set up schools in monasteries throughout Europe. Charlemagne had an impact in many other areas as well including church music, cultivation and the planting of fruit trees, and civil works. One example of a civil work was the building of the Fossa Carolina, a canal built to connect the Rhine and Danube rivers. He left his empire to his son Louis the Pious. He was crowned Holy Roman Emperor on Christmas Day. Charlemagne was illiterate, but he believed strongly in education and enabling his people to be able to read and write. He was married to five different women during his lifetime. He is nicknamed the "Father of Europe" as the founding father of both the French and the German Monarchies.